Until the conversation turned to the events of last fall — specifically, Mike’s latest, but certainly not last, gesture regarding what has become known simply, and famously, as the ‘coat thing.’ That’s when the dam holding back the emotions broke. To explain, one needs to go back two more Octobers. That’s when Mike first entered the Homer Street School as a celebrity reader with the Link to Libraries program. As he walked down the main hallway, he noticed a number of winter coats, department-store tags still on them, hung on hooks along one wall. Upon asking what this was all about, he learned that many students’ families cannot afford winter coats, so the school has long been proactive in soliciting donations of coats and money to buy more. But need had traditionally exceeded supply, he was told. According to Homer Street School lore, Mike then asked what he could do to help close the gap, and soon commissioned a check for $2,000 — much more than was requested. A year later, and a few weeks after he was diagnosed with incurable stomach cancer, Mike was back at the school — to read and present another $2,000 check for coats. And last October, after already living longer than his doctors told him he probably would, he was back again, to read and do a lot more than cover another year of coats. “He said to me, ‘I might not be here next year, but those kids will be here, and some of them will need coats, so I want to give the students at Homer Street School $2,000 for an additional five years,’” said Sullivan, her voice cracking before she had to stop for a minute and compose herself. “And later, he wrote me an e-mail a few days before he passed away to thank me for an inspirational message I had sent to him, and for allowing him to be part of something special here at the school. The coat thing is one very literal example of how Mike’s generosity, his ability to make a difference, will live on long after his passing. 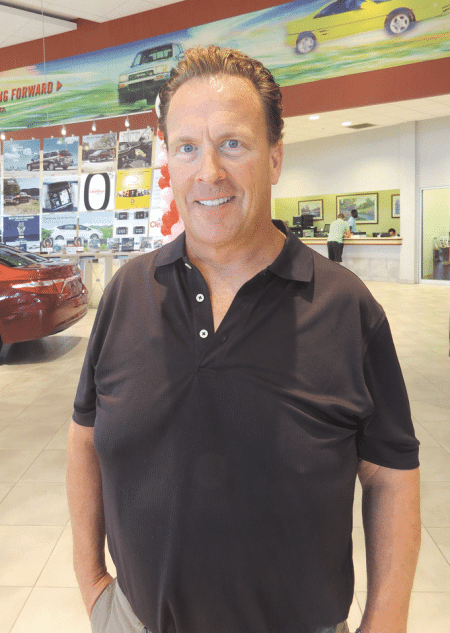 There are many others, from the donation the Balise company made to the expansion of the Sister Caritas Cancer Center in Springfield, to his work supporting efforts to assist autistic children and their families (one of his daughters has autism). 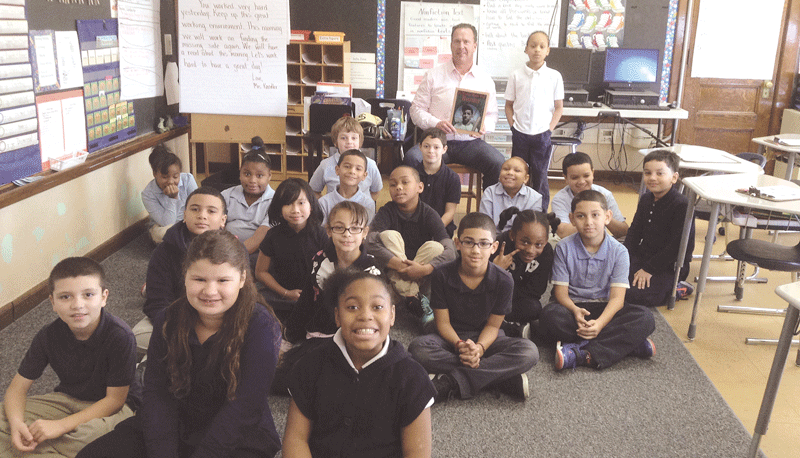 Mike Balise began his relationship with Homer Street School as a celebrity reader with Link to Libraries; it soon evolved into much more. Indeed, Mike made Community Resources for People with Autism, an affiliate of the Assoc. for Community Living, the primary beneficiary for those wishing to honor him following his death. Jan Doody, the recently retired executive director of the center, said it’s far too early to know how the funds received in Mike’s memory will be used, but she does know they will certainly advance the agency’s mission for years to come, and help fill recognized gaps in support for individuals with autism. While effectively filling such gaps is certainly one reason to call Mike a Difference Maker, another was the inspiration he provided to those across the area through the courageous manner in which everyone says he fought cancer and the death sentence he was given. Everyone, that is, except his brother, Jeb, who took a departure from the rhetoric that usually accompanies such a battle, and offered a different, quite profound take on what went down over the 15 months after Mike was diagnosed. “What he did, and I think he did it better than most people in that situation, is that he didn’t really battle cancer,” Jeb explained. “What he did was focus on positive things, enjoying life, and making a difference. Jeb Balise says his brother, seen here with his family, didn’t battle cancer; rather, he fought to get the most out of every day. 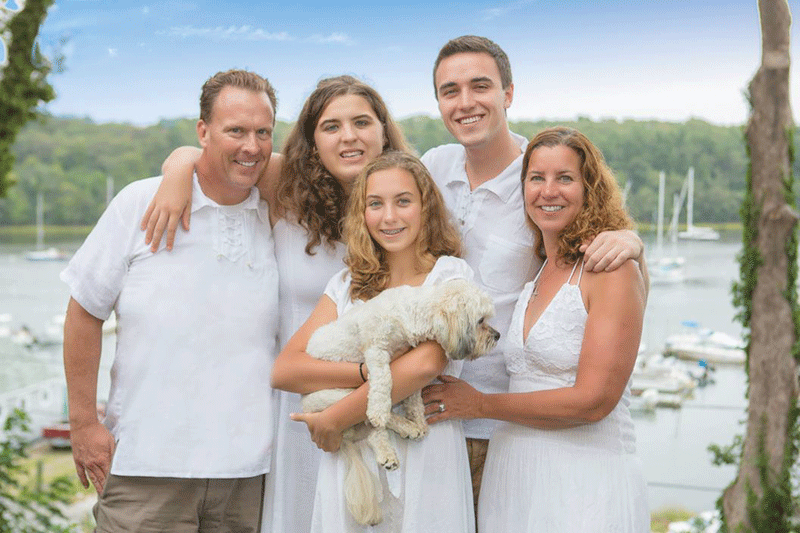 By focusing on life, not only for those 15 months after his diagnosis, but for all 50 of his years, Mike Balise remains an inspiration to all those who knew him. For that reason, and for spending much of that time devoted to finding ways to help others, he was — and indeed always will be — a true Difference Maker. Mike died early in the evening on Dec. 23, roughly a week after entering hospice care, and several days into Homer Street School’s two-week winter break. Thus, the staff at the facility didn’t have a chance to collectively grieve until a meeting after school let out on Jan. 4, their first day back. It was an emotional session, said Sullivan, noting that there was literally not a dry eye in the room. People shared their thoughts on the many ways he supported the institution, she went on, and initiated talks on how best to honor him. A statue of a man reading a book to children — a non-personalized model that Sullivan had seen on some Internet sites — was one early proposal, but the concept now gaining serious traction is a plan to name the school’s library after him. That would certainly be fitting, because although he actually read to students there only a few times, Homer Street, a nondescript school in the city’s Mason Square neighborhood that opened its doors in 1896, and is thus the city’s oldest elementary school, has become a kind of symbol of Mike’s work within the community. The building itself is slated to be replaced over the next few years, said Sullivan — work to identify a site in the area, near American International College, is ongoing — and there will very likely be a new name as well. But the ‘coat thing’ and the way in which Balise attached himself to the needs of the students at the school will long outlive both the man and the structure. Indeed, in many ways, his work there epitomizes not just what he did, but how, and the enthusiasm and tireless energy he brought to such endeavors, said Susan Jaye-Kaplan, co-founder of Link to Libraries (LTL) — she was among BusinessWest’s first Difference Makers in 2009 in recognition of her efforts — and a self-described friend of Mike’s. Upon that first visit to Homer Street School in late fall 2013, she recalled, he adopted the facility in a manner that went well beyond reading on the rug at the front of a third-grade classroom. And the need for such items there was acute, as poignantly explained by Nancy Laino, the school’s instructional reading specialist, who was happy to use the past tense as she talked. This reality explains why teachers would pitch in money themselves and work with a host of service agencies to purchase coats — and why Mike saw several along the wall of the main hallway on his first visit to the facility. But, eventually, his commitment to the school went behind the coat thing. Indeed, last fall, Mike told Jaye-Kaplan he wanted Balise to sponsor the school as part of LTL’s Business Book Link program. She told him it already had a sponsor, albeit one on a one-year contract, a reply that drew a response she said she won’t ever forget. And this aggressive form of attachment to a cause was hardly isolated, she went on, using the word ‘humble’ and ‘committed’ frequently as she talked about him. Mike Balise, second from left, presents a check to Community Resources for People with Autism to, from left, James Foard Jr., former president of the board of directors of the Assoc. for Community Living, parent of Community Resources; Jan Doody, recently retired director; Nancy Farnsworth, educational advocate; and Kaitlyn Holloway, projects manager. Such character traits explain why, even though the Balise company’s many and diverse philanthropic efforts were and are undertaken by a team, and Mike was simply a part of that team, he nonetheless stood out when it came to work in the community, said Jeb. He was, in most respects, the face of the company — even if it was his voice, heard on countless Balise radio commercials, that most people knew, Jeb went on. But his work at Homer Street School and many other places went well behind that. “When Mike saw the ability to make a meaningful difference, he would step in and do it,” Jeb explained, adding that his contributions often came with causes that fell between the cracks, groups that could use his organizational — and entertainment — skills, and with filling gaps in funding. He cited a number of examples, starting with the many requests the company receives for donations of vehicles to help individuals, families, or nonprofits in various types of need. Summing up the corporate response to such requests, he said there are many social-service agencies that, among their many other responsibilities, handle such matters, and Balise will step in only if such needs can’t be met through such channels. “But quite often, Mike would give a vehicle to a person who didn’t fall into any of those categories,” he went on. “It would be a mom whose husband died … she had four kids … one of the kids has a job but now he’s going to lose his job because he has no transportation to it, that kind of thing. It was people like this, people who fell under the radar screen, that he sought to help — and he helped a lot of them. “That’s what Mike was good at — finding people who really needed the help,” Jeb continued, adding that one of the causes he attached himself to years ago was autism. This work has taken many forms, from working with his friend Doug Flutie to stage a free-throw-shooting competition at the Basketball Hall of Fame to raise money for Flutie’s foundation, which assists those with the condition, to taking an autistic child to visit New England Patriots Head Coach Bill Belichick last fall. But the main beneficiary (literally and figuratively) of his time, talents, and desire to help was Community Resources for People with Autism. Founded in 1989 by a group of parents with autistic children, this state-funded organization, as the name suggests, is focused on providing resources to a host of constituencies. These range from individuals diagnosed with the condition to their families to the school systems tasked with providing them with an education. The resources provided by the Easthampton-based agency, one of seven across the state with the same mission, vary as well, from information and referrals to a resource library; from training and education to educational advocacy. It is with the last item on that list that Mike (whose family received various forms of support from the agency), acting as part of that aforementioned team at Balise, decided to step in and fill another critical gap. Indeed, educational advocacy, which involves guiding parents though the individualized education program (IEP) and special-education processes, is the only service not funded by the state. But it’s something many parents need, said Doody, adding that it is very difficult for them to articulate and then fight for all the services their child needs and is entitled to. “It’s hard for a parent to know how the law works, let alone possess the negotiating skills needed, to advocate for their child in front of school officials,” she explained, adding that Nancy Farnsworth, the agency’s educational advocate, has both parts of the equation covered. The rate for her services generally runs about $45 per hour, although there is a sliding scale, Doody went on, noting that families sometimes need help meeting such costs. Various forms of support have been secured over the years, she explained, but, as with the coats at Homer Street School, there was a gap between need and the help available. It was roughly 16 months ago, or just after Mike was diagnosed with stomach cancer, that the Balise company was first approached by the agency about helping to close that gap. 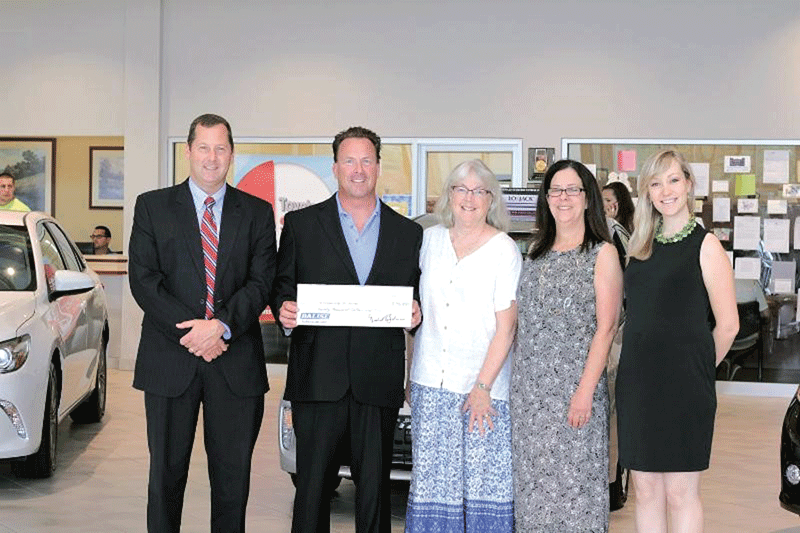 The $20,000 the company eventually donated last fall — Mike presented the ceremonial check at one of the company’s dealerships — will provide scholarships and assistance for roughly 10 to 15 families, said Doody, making this a substantial gift that will have a lasting impact. The same can certainly be said for Mike’s decision to name the agency his beneficiary of choice. Doody placed herself in that category, noting that she dropped off a check in Mike’s name early this month. She said it certainly isn’t known yet how her gift and all the others will be put to use by the agency to support its mission. But there is already some sentiment toward using at least a portion of those funds to expand the educational-advocacy program — Farnsworth currently works part-time — and provide more help to those who need such services. If that is what transpires, it will be just one example of how Mike and the Balise company will be closing gaps long after his passing. 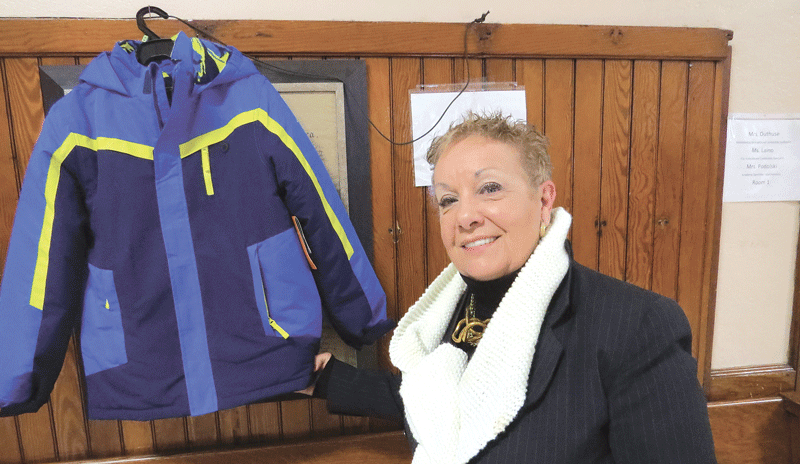 There is just one coat hanging in the hanging in the hallway at Homer Street School, said Principal Kathleen Sullivan, because everyone who needs one has one. Today, there is just one winter coat, a large blue one with gold accents, hanging in the main hallway at Homer Street School, just a few feet from a large collection of hats, mittens, and gloves. And it’s been there for a while, said Sullivan, adding that this is because every student who needs a coat has one, a departure from years past. Mike Balise saw to it that this was the case, and he will continue to see to it, even though his fight with cancer has ended. This is an example of how his work as Difference Maker continues to live on. And there are many more where that came from.